This is a black and white photograph of a view looking up the roadway to the Ontario Ladies' College. The original Sheriff's Castle and Ryerson Hall wing are at left. The passageway to the cottage can be seen at right. There are several students on the road in the foreground. The passageway to the Cottage was built in 1887. 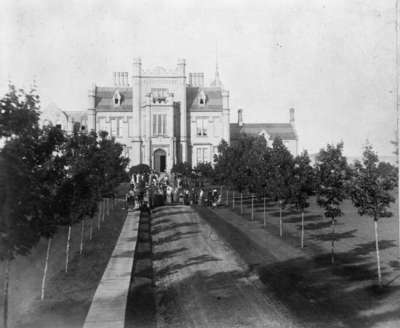 Ontario Ladies' College, c.1890, W. E. O'Brien. Whitby Archives 23-000-302.